As you already know, I am the proud owner of an Uuni Pro and have been for a fair few months. 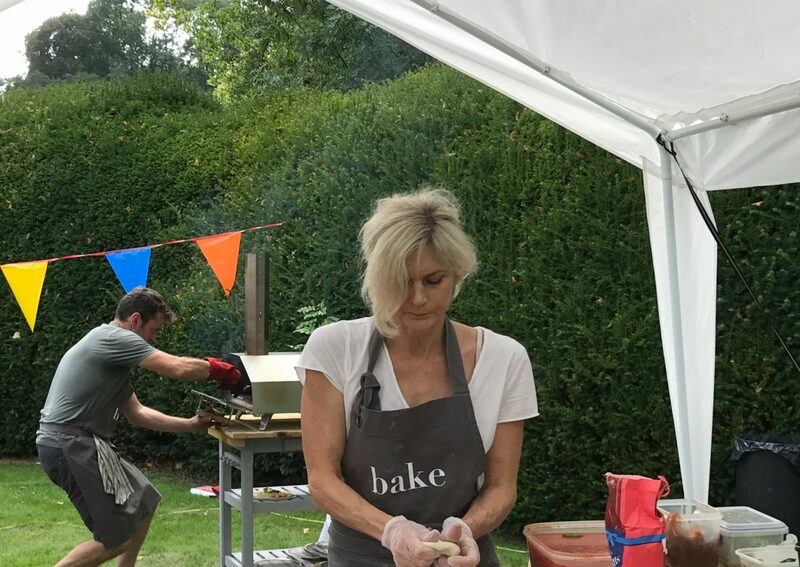 We have had a Summer of eating wood-fired pizzas cooked in our Uuni Pro shared with family and friends, as well as with the residents of Coln St Alwyns and the surrounding villages at the the Coln St Aldwyns fete in early September. ‘Attention all pizza lovers! We’re searching for Pizza Taste Testers – these are paid roles combining working on and tasting new recipes, being the first to give our new products a whirl, and showcasing Ooni to the world through your social media profiles. Sound like you? Click the link in our bio to read the full job description’. Reading through the post, I felt that the job had my name written all over it. Since reading the post and seeing the 927 likes and 232 comments, I have realised that many people feel the same way. As they say though ‘you have to be in it to win it’ so over the last few weeks I have been working on my 1 minute video application, which Ooni want instead of a traditional CV application. Filled with excitement, my friend Colin from Design and Code and I came up with an idea for a video – my Uuni Pro and I on the road. Initially we planned to take our Uuni Pro on the road down to Devon where Jo and I were spending the weekend, so that he could finally pick up the surfboard that he had painstakingly handcrafted out of poplar for his 50 Birthday in June. We had offered to cook pizzas for all the surfers on the Saturday night, but the owner of Otter Surfboards had already made arrangements for Canteen to provide the evening meal. We had also thought of making pizzas on the beach on Sunday as the sun went down, but none of this happened as the weather over the weekend was some of the worst weather we had for a while – torrential downpours. Not deterred, we decided on plan B. Not quite as exotic as Plan A but a plan nevertheless. Late on the Friday afternoon, we decided to stop overnight at our in-laws in Bath en route to Devon. As we had imposed ourselves on them at a late stage, we offered to take our Uuni Pro with us and cook pizzas for the family. I started the dough at home, trusting that it would prove on our 1.5 hour journey to Bath. It did – by the time we got to Bath, the dough had proved well. As soon as we arrived, Jo unloaded the Uuni Pro and set it up for lighting. At the same time, I got on to making the tomato sauce and caramelised onions and prepping the toppings and the pizza bases. The whole process took 3 hours (starting at 17.45 pm and finishing at 20.45 pm with us sitting down to eat a range of four pizzas), including a 1.5 hour trip from Coln St Aldwyns to Bath. Not bad, even if I say so myself and certainly helped by the efficiency of my Uuni Pro – transporting, setting up and lighting and cooking (60 seconds). I should possibly mention the most important part i.e. that we were shooting footage of all the stages as we went so that I could put together the 1 minute video required for the application. Although there is always room for improvement, the evening resulted in us having enough video footage for my application. We also had delicious pizzas for dinner – an added bonus. Since our pizza making evening in Bath we have been working on editing the footage into a 1 minute video fit for submission. After quite a bit of tweaking, I finally submitted my application on Tuesday. The closing date for applications is the 14 October so I will have to be patient for a few days. I am crossing all appendages until then. If successful, I will definitely share my video with you. Baking for a good cause? Earlier last week one of my colleagues asked me if I would bake him a couple of loaf cakes for the Macmillan’s World’s Biggest Coffee Morning, a lemon drizzle and a fruit loaf. Not only did he ask me if I would bake for him, but that he would pay me for the fruits of my labour. I jumped at the chance, both of paid employment as well as baking for such a worthwhile cause. I did offer to bake the cakes at cost for such a good cause, but I was told that he wanted to pay the full price of the cakes. After work, the day of the bake, my stomach started to niggle. I had intended to sleep when I got home to try to shake off the niggle, but various things got in the way. After a bit of a rest (but not sleep) I set about making the lemon drizzle and fruit cake. As usual, I had scoured the Internet for suitable recipes. 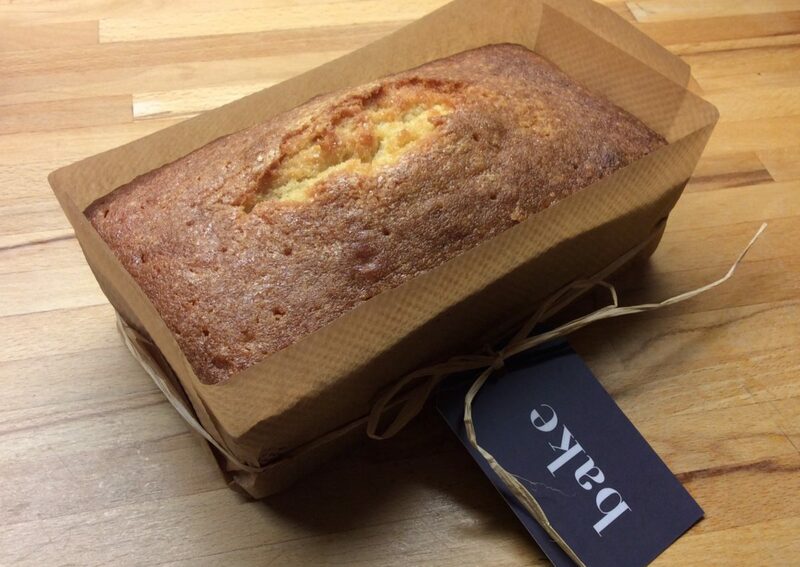 After an extensive search I came across a lemon drizzle cake from Baking Mad and a fruit loaf from The Kitchen Sanctuary. Of course there is always a danger of baking something you have never baked before for a client, but I didn’t have tried and tested recipes for either loaf cake. As I had started the fruit cake before work, as the dried fruit needed to soak in the tea for several hours before use, I thought I should complete the fruit cake before I started on the lemon drizzle cake. The bake went relatively smoothly. I kept a beady eye on the cake whilst baking ensuring that the top of the cake was not becoming too dark. It was only in the last 15 minutes that I covered it with foil to prevent further darkening of the top. Although I felt that the bake was not too dark, when I photographed the cake for my Instagram page, I noticed that the bake was a little darker than I had initially thought. On these occasions I hear the words of my Chef Tutor in my ear saying ‘colour is flavour’ and hope that his words are correct. After my fruit loaf was safely out of the oven and cooling nicely, I set about preparing and baking my lemon drizzle cake (which I had started preparing while the fruit cake was in the oven). The bake went well, except for the fact that I had to bake the cakes in my domestic oven rather than my professional oven as I couldn’t find the 13 amp extension lead for the professional oven and I didn’t have the energy to drag it by myself across the kitchen floor to plug it into the 13 amp plug. I am not sure what it is about my domestic oven, but I am convinced that the fan is a little too fierce and blows a mighty gale in one direction, as my bakes often look a little windswept. The lemon drizzle cake was no exception. I half convinced myself to do the bake again, but it was getting late and I really needed to get to bed for my morning shift. There was nothing wrong with the bake of the lemon drizzle cake, it was just the the left side of the cake was a little higher than the right, despite the fact that I had evened out the top of the cake mixture prior to placing it in the oven, as instructed. I wrapped the cooled cakes in some baking parchment, tied with raffia and a ‘bake’ label and went to bed. I managed to get through the bake, as well as do the costings for the cake without my stomach causing me too much trouble. Or so I thought …. At about 1.30 am, I woke up with very severe abdominal pains. I lie down in a hot bath, a couple of paracetamol and hot water bottle did not do the trick for long and sometime between 1.30 am and 5.40 am when my alarm goes off, I got out of bed and was violently ill. Although I did go back to sleep after this, it didn’t take me long to realise when I woke up that I was too ill to go into work. I also had to decide what to do about the cakes. Although I was almost entirely convinced that this episode was related to my underlying health condition, I couldn’t be 100 % certain and so I took the decision to inform the person I had made the cakes for about the situation. I left it to him whether he used the cakes for the coffee morning or not. Mustering enough energy to take the cakes (with note) to work just before 8 am on the Thursday, I went home and back to bed, where I remained for the best part of two days. I literally slept for the first 24 hours. Although still bearing the scars of this most recent episode of illness, I am now back at work. I learnt on my return that the gentlemen who I made the cakes for didn’t donate them to the coffee morning, but instead decided to eat them himself (with the assistance of his wife). They have eaten the lemon drizzle cake and are now working their way through the fruit loaf. I have been advised that both cakes were very delicious. The sad thing is that although I was poorly, it wasn’t anything contagious (just my own medical condition). 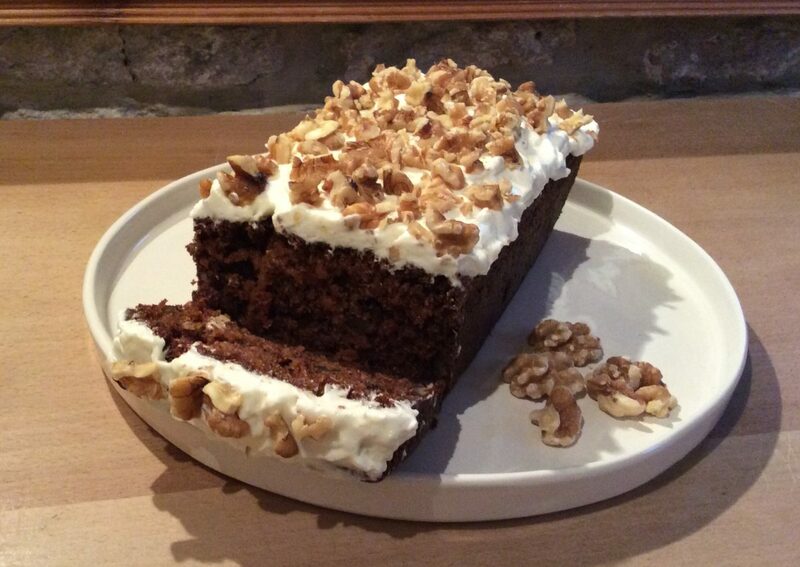 By being cautious (and honest) my cakes couldn’t be used as intended to help a good cause. Although I only got the cost of the ingredients (which I was grateful for), I still wouldn’t change what I did as could not have forgiven myself if someone had got ill eating one of my bakes. Lets hope I have better luck next time. The mid to end of the last week in August was a challenging one with a number of new experiences. The time had finally come to prepare for the Coln St Aldwyns fete. 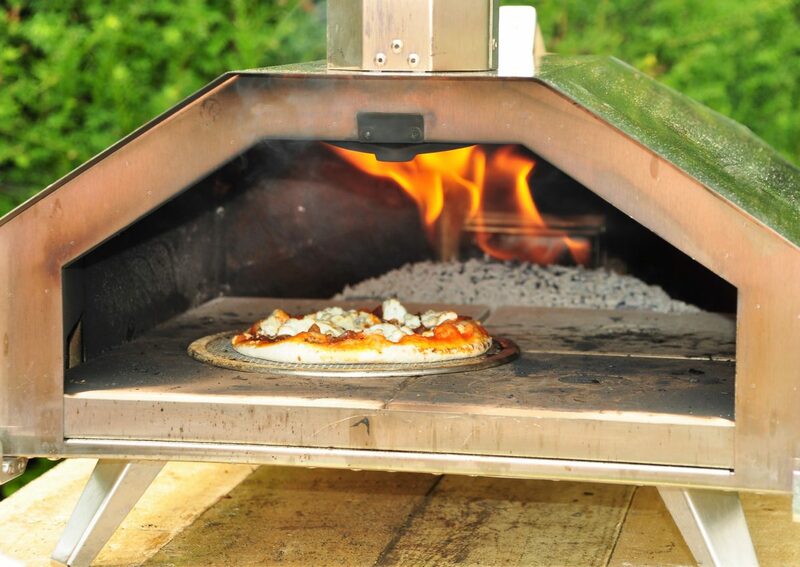 When we agreed to make 80 pizzas for the Coln St Aldwyns fete in our OoniPro Professional outdoor pizza oven some months ago it seemed like months away. However, there I was mid week the week before last ensuring that my ingredients for the pizzas would be delivered as scheduled. I should add at this point that although the original plan was just to make 80 pizzas for the fete, I was asked by the owner of Lynwood & Co to make the guess the weight of the cake, cake so in addition to checking ingredients mid week there I was making sugar craft coffee berries, leaves and letters, spelling Lynwood. Thursday was final shopping day for the remaining ingredients before prep day on Friday. Friday had a slow start as I had scheduled in my pre-holiday manicure and pedicure and required waxing a while back so my first stop of the day was to Purely Divine in Fairford. Although I find manicures and pedicures decidedly boring, I wasn’t worried about the time as our dog walker/sitter wasn’t arriving until 1 pm to pick up the hound and I didn’t want to start cooking until my dog and its fur were well away. I was also waiting for my Blue Seal Turbofan Compact Convection Oven to arrive at 2pm to do my baking as I had a four layer cake to make. Talk about Just in Time Philosophy. Still not perturbed as I had my list and knew what I needed to do when, all should have gone to plan had my underlying stomach issues not started to play up. Bad eating and lack of hydration, on my part, on Wednesday and Thursday had caused my stomach to niggle and because I had to be on my feet all day Friday, rather than resting, by 9 o’clock even pain killers could not keep the pain at bay. I had no option but to forge ahead as I had both the Coln St Aldwyns Fete Committee and Lynwood & Co relying on me to deliver. With the help of Jo (who had to spend time helping me rather than doing all the other tasks he needed to do as part of the Fete Committee) by the time we went to bed all the pizza prep was done and the Lynwood & Co cake was baked. All that remained was for me to roll out the pizza dough on Saturday morning and to ice and decorate the Lynwood & Co cake. I should add that I also made 40 cookies on Friday for good measure, cookies which remained largely uneaten as there was no cake stall as I thought, just a coffee/tea and cake stall, which seemed to be inundated with cakes anyway. I should possibly add that I also made an additional cake on Saturday morning (again for the imaginary cake stall), which although being displayed at the coffee/tea/cake stall late in the day went very quickly despite the mishap that happened to it shortly after we arrived at the fete on Saturday morning (more of this later). With all the preparations on Saturday morning and with Jo rushing between the fete site and home, trying to set up the stalls and take what we needed for the pizza stall, my sister, Gilly and I only arrived at the fete site for 12 pm. The fete started at 12.30 pm. With the other food provider (burgers and sausages in a roll) looking mighty fine and up and running when we arrived, we were really on the back foot. The pizza oven had not even been lit as Jo had been too busy organising other things at the fete. My sister and I did the best we could to set up as quickly as possible, but if it had not been for Rob, the owner of Lynwood & Co, who started the pizza oven, we would have been even further behind than we were. The only saving grace (although it didn’t feel like it at the time) was that the interest in the pizzas was very slow at the start so we had a bit of time to start things up. Although Rob saved the day by starting the pizza oven, in searching for the pellets to light the pizza oven, Rob turned my Orla Kiely cake tin upside down (thinking it had pellets in it) so the icing and chocolate shavings on top of my chocolate cake were left a little dishevelled as the cake was turned on its head – I managed to neaten it up enough to serve at the coffee/tea/cake stall. Despite the many lessons to be learnt, all in all the day went very well (I couldn’t have done it without the help of Jo, Rob and Gilly). We finished off with a quick clean up, a drink or two at friends up the road and a meal at the New Inn before doing our final packing for our holiday which was due to start at 3.15 am on Sunday morning – the time our alarm was set to ensure that we would get to Heathrow on time for our early morning flight to Geneva en route to Chamonix for five days of trail running and relaxation. My next door neighbour, but one, caught me in the garden the other day and informed me that her husband and her were off to London for a few days and that she would appreciate it if we could pick (and use up) some of the raspberries growing in her garden. Having used her raspberries before to make a raspberry coulis, it didn’t take much persuasion and before long, Jo had picked a large punnet of raspberries. Mindful that I had a punnet of raspberries in the fridge, I thought I should set about doing a bit of baking. Whilst flicking through Donna Hay’s ‘Basics to Brilliance’ for her chewy chocolate chip cookie recipe, I came across her recipe for a raspberry swirl cheesecake. Raspberries and baked cheesecake, what more could you ask for? So, on Saturday evening, exhausted from our first session at British Military Fitness, I set about baking the raspberry swirl cheese cake. The first step was to make the raspberry syrup. The second step was to make the ricotta cheesecake base and filling. All went well with the first two steps, or so I thought…. The third step was to swirl the raspberry syrup through the ricotta cheesecake base. At this point, I realised that my syrup (after cooling) had become less of a syrup than a jam and rather than being swirled through the ricotta cheesecake it seemed to slide inelegantly through the surface of the cheesecake only to disappear beneath the surface. Not deterred by my disappearing raspberry syrup (or should I say, jam) I placed my cheesecake in the oven at 150 degrees Celsius for 50 minutes. After which, I turned off the oven and left my cheesecake in the oven for a further 50 minutes as instructed. After an hour and forty minutes, I placed my cheesecake into the fridge to cool for at least an hour. At the point that I placed my cheesecake in the fridge, it looked very much like a cheesecake, albeit without a raspberry swirl. After an hour (there is only so long that a girl can wait for her dessert), I removed the still slightly warm cheesecake out of the fridge to cut a couple of pieces for our dessert. A couple of smallish cracks had appeared on the surface of the cake but I wasn’t overly bothered. I finished off the cheesecake with a handful of fresh raspberries and all was well in the world of cheesecakes again. As suspected, the raspberry syrup/jam had sunk to the bottom of the cheesecake i.e. between the base and the cheesecake topping. While this may not have been as aesthetically pleasing as raspberry ripple it certainly did not affect the taste of the cheesecake. The cheesecake was a taste delight, even if I say so myself. It took a lot of will power to refrain from having a second slice. 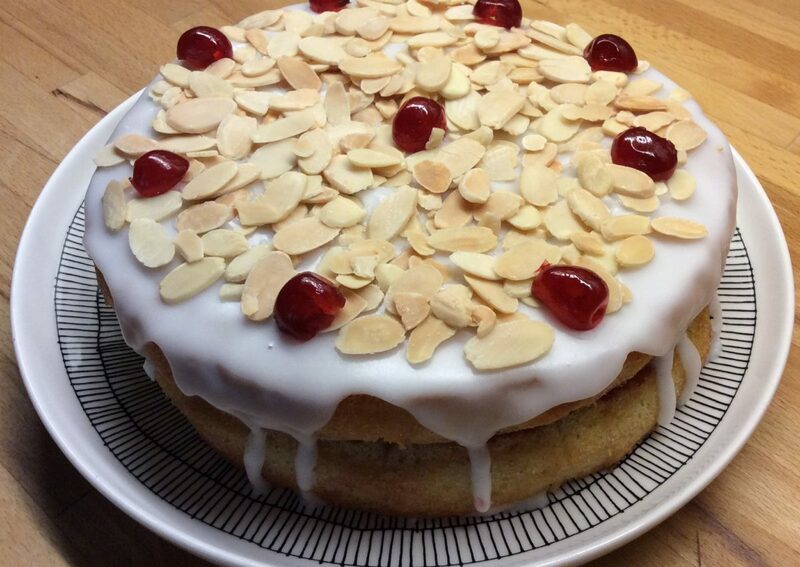 The following morning, and in preparation for a large family do at my younger sister’s house, I set about baking my second raspberry bake of the weekend, raspberry Bakewell. Although I had mentioned to my husband that I needed more raspberries for my second bake the night before, he had either not heard or registered my request so in the morning, as I started my bake, I asked him where the freshly picked raspberries were. He said that they weren’t any. Reluctantly, he ventured into the neighbour’s garden in the light of the morning to pick me the raspberries for my bake. He came back with 200g of the 250g of raspberries I needed for my bake, but I didn’t have the heart to ask him to pick anymore. I hoped that 200g would be enough. Following the recipe to the letter, including processing all the ingredients in a food processor (the first time I have made a cake in a food processor), I scattered my raspberries over half the cake mixture in the tin and then covered them with the other half of the cake mixture as instructed. Not convinced by the texture of the cake mixture (a lot more dense than normal cake mixture), I placed my cake in the oven and baked as instructed. I was surprised to see that the baked cake had such a good rise and looked as it did in the photo of the BBC Good Food site. 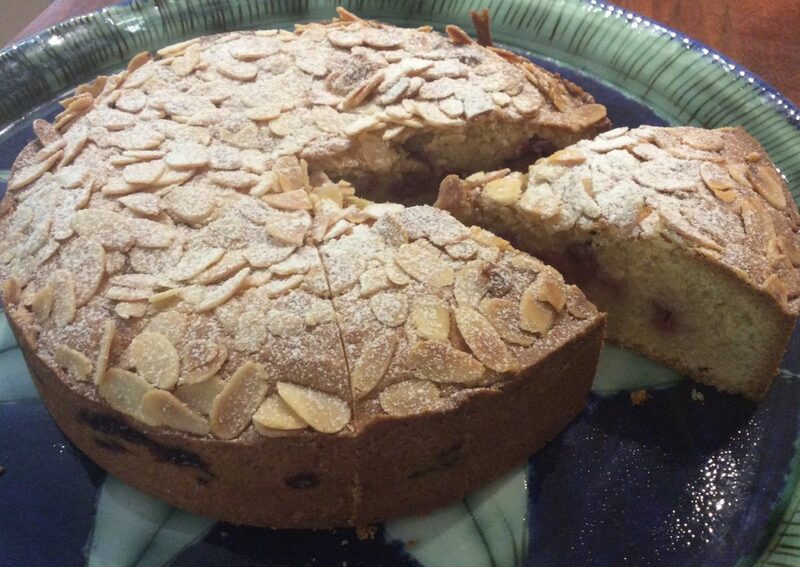 Still a bit nervous, I cut into my bake at my sister’s house after lunch and was very pleasantly surprised to see that the cake had a light, spongy texture and the combination of the almonds and the fresh raspberries went very well (200g of lovely sweet raspberries was enough). I should mention that I did take some of my raspberry cheesecake to the lunch as well, albeit somewhat reluctantly as in the morning after my cheesecake bake, I discovered that the cracks on top of my cheesecake had multiplied and deepened overnight and my raspberry cheesecake was no longer the fine looking specimen from the night before. Knowing that it had a delicious taste and ignoring the adage that ‘you eat with your eyes’, I thrust my cheesecake onto my family members while apologising for its less than perfect appearance. Let’s just say that taste won the day and my family members were very happy with their dessert options, which also included a delicious Mary Berry chocolate cake, which my younger sister had lovingly prepared. I have pondered about the cracks since and my theories are as follows: (1) I should have left the cheesecake to cool at ambient temperature first before putting it in the fridge to cool – the cold fridge could have ‘shocked’ the warm cheesecake or (2) as the raspberry syrup was more of a jam than a syrup, perhaps the density of the jam in the light cheesecake caused the cheesecake to crack, especially as the jam and the cheesecake mixture could have cooled at different rates. Your thoughts? On Sunday evening, still uncomfortable with his early morning raspberry forage, I armed my husband with two slices of cheesecake (the best two slices, I might add) and two slices of the raspberry Bakewell and suggested that he took them around to our neighbours to thank them for their raspberries. Happy that he had confessed to his ‘early morning crime’ (the neighbours were not concerned in the least – funny that!) and giving the neighbours something in return for their raspberries, my husband was able to relax for the rest of the evening with a clear conscience. The following morning, my husband received an email entitled ‘We know Coln’s best pastry/pudding chef!’ with the message ‘.. many thanks, Bridget and Jo. Crowned a perfect evening!’ Our neighbours had been at the local pub with a couple of friends and had followed up their meal at the pub with the raspberry cheesecake and Bakewell cake. We were even sent a photo of the four of them tucking into their pudding with glee. So while the raspberry may be seen as a ‘gone wrong strawberry’, it can still bring delight to many and make me feel that maybe, just maybe, my change in career my be worth it, even if it takes a bit of time to establish myself. Over the last few months I have been baking quite a few scones. Not for any other reason than I like scones, both savoury and sweet. I have tried white and wholemeal scones, with and without dried fruit. I have tried cheese & sweetcorn scones and cheese & poppy seed scones. 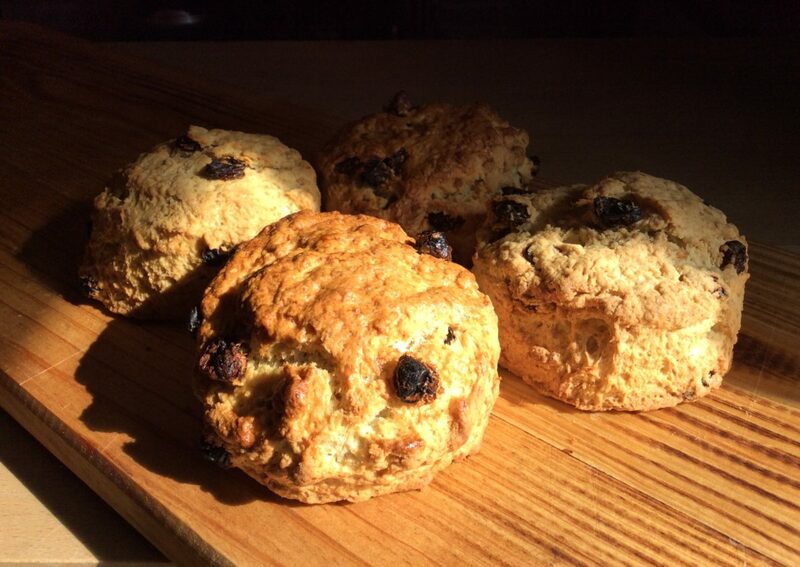 I have tried scones using flour containing gluten and scones using gluten-free flour. I have even tried gluten-free scones with fresh fruit i.e. pear and blueberries. ‘Thanks so much for the scones, which were delicious!! Look forward to the time when they are available for sale in the shop on a regular basis’. The feedback in person was equally as favourable, albeit that the request was that if I made them again that I should try a scone with more wholemeal flour and less sugar. They also mentioned that they preferred the unglazed scones. Not deterred by the quest to find a scone with a higher percentage of wholemeal flour and less sugar, and with a further request by the same neighbours for more scones, I scoured the Internet again. This time to see if there was such a thing as a scone recipe book. I found a couple on the all too accessible www.amazon.co.uk website: The National Trust Book of Scones and The Secret Life of Scones. Of course, even with Amazon Prime they were not going to arrive on time for my second attempt at wholemeal scones, so yet again I scoured the Internet for wholemeal scone recipes. This time I came across a recipe courtesy of The Irish Times, which offered a wholemeal brown scone with a 1:1 ratio of wholemeal:white self-raising flour and only 30g of sugar (which was optional). It also had the welcome addition of buttermilk instead of milk which adds a ‘tangy flavour’ to the scone, as well as according to www.Livestrong.com, ‘adds complexity and depth to the finished baked good’. Buttermilk, allegedly, also helps with the rise (see tips below). While the end result was less to my liking than the National Trust wholemeal scones (they were a little too dense), my neighbours enjoyed them and in fact preferred them to my first offering. I was even paid for my efforts! Not long after I made and delivered my second attempt at wholemeal scones, than I heard the familiar knock at the door of the Amazon delivery man (he is an all too regular visitor at the moment as I set up my professional kitchen at home) with my first of two ‘scone books’, National Trust Book of Scones. To cut a long story short, my second ‘scone’ book arrived on Sunday and I spent the afternoon reading through the information and recipes – a perfect way to pass the time on a drizzly summer afternoon. I even attempted another variety of scone yesterday, the ‘Ploughman’s scone’, a light and delicious white scone, flavoured with cheddar cheese, pickled onions and apple. Eaten warm with a generous spread of butter it was a perfect lunch. If you have read my previous posts or seen my photos on Instagram or Twitter (or on this site) you will know that my style in quite simple. My focus has always been on taste and simplicity in decoration rather than anything ornate. However, as my plan is to meet potential customers’ baking requirements, I have had to rethink what I can offer. I don’t think offering cupcakes with a simple swirl or a carrot cake/loaf with cream cheese frosting is going to cut it so I have decided to up my game when it comes to decorating cakes and bakes. As part of my Diploma in Professional Patisserie, we did sugar craft for a couple of days, which I thoroughly enjoyed, but have not done since. We made sugar craft roses, leaves, ivy, honeysuckle and jasmine, if I recall correctly. With my renewed interest in developing my decorating skills, I decided to scour the Internet for suitable courses. Let’s just say that there are a lot of courses out there, the majority of which are too expensive, too long, not long enough, too far away or not the right subject matter. At this point, I want to develop my skills in two areas: sugar craft and buttercream. 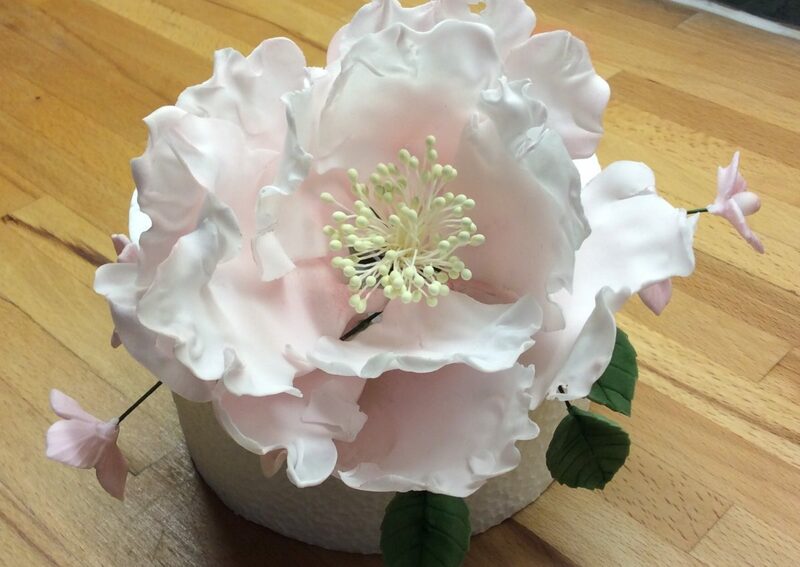 Despite many of the courses on the Internet not being what I was looking for, I came across the Rock Bakehouse and a 1 day course called Modern Sugar Flowers. The course met my brief. Being in London it was not too far away (as well as was an excellent opportunity to visit our eldest son, who has recently relocated to London from Glasgow); being a 1 day course it was long enough, but not too long and as I was the last person on the course, I even got the course at a slightly reduced rate. So, on Friday, on what was supposed to be the hottest day of the year in London, I arrived slightly early to the course (we were told not to arrive more than 15 minutes early as they would be setting up) to be ‘greeted’ by a very unassuming, partially shuttered building, with the small sign in the window, identifying it as Rock Bakehouse. I can’t lie, I honestly felt that I had made a mistake booking onto the course as the first impression was definitely not a good one. With a quiet word in my own ear, I reminded myself not to judge a book by its cover and then went for a short walk around the block in search of a coffee and to while away a few minutes until 15 minutes before the course started. Let’s just say that I was right to have a quiet word in my own ear, as once I got inside the rather unassuming building, I was met by a light and airy, well set up teaching room, all ready for a day of sugar flower making. The result of my day’s work was a beautiful peony, a rose and rose bud, five hydrangea flowers and some leaves. Was the result of my toil a perfect display of sugar flowers? In a word, ‘no’. Was I pleased with the result? In three words, ‘in the main’. Am I glad I did it? Most definitely, ‘yes’. Did I set out what I set out to achieve? A vehement ‘yes’. And finally, would I recommend the course to others? A definite ‘yes’. Anyway, as always, you can judge for yourself by looking at the photograph which accompanies this post. PS, I should mention that the tutor on the course was excellent. Highly skilled and very good at explaining what to do. 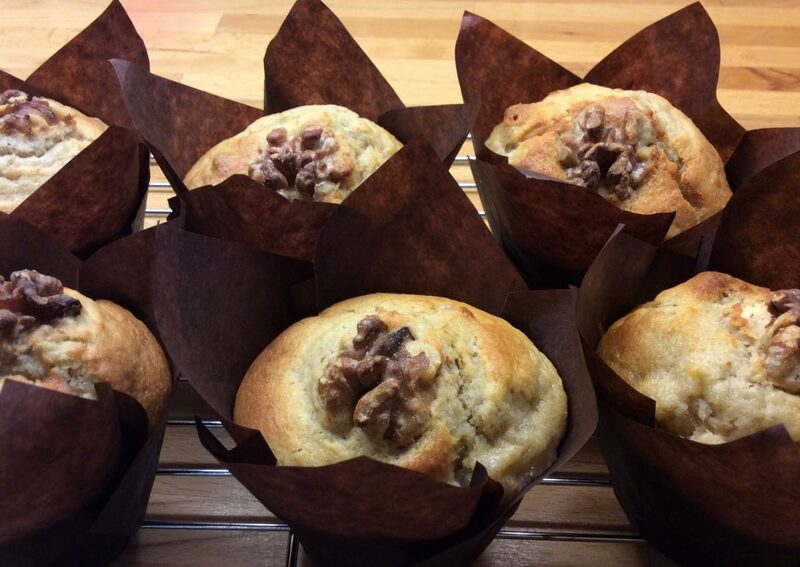 Muffins have always been something that I have enjoyed making. They are easier than most bakes, but still result in a delicious morsel to eat in a fraction of the time. No mixers, blenders required, just a couple of bowls, one with your dry ingredients and one with your wet ingredients and a fork or spoon to combine the two. The only care you need to take is when you add and mix your wet ingredients into your dry ingredients, as over-mixing at this stage of the process will result in an over-processed looking muffin with a chewy rather than light and fluffy texture. If you live in the UK, you will know that it has been very hot and dry (i.e. no rain, not a lack of humidity) of late (the experts are saying unprecedented), well with my reorganisation of my kitchen to make way for home baking, my fruit bowl was relegated to the top of my new storage racks in which there is a place for everything and everything is in its place. However, there is a problem with the relegated spot for my fruit bowl; it is a little too close to the overhead lights, which I turn on when I need a little more light in that part of the kitchen. As a consequence, when I was taking down a couple of apples to have with my lunch yesterday, I discovered a few browning bananas. Not wanting to throw them away (as they say, waste not want not), I decided that the first mission of the day today was to turn what would otherwise be food for my food waste bin into a delicious breakfast. After Googling banana muffins I settled on a recipe from BBC Good Foods, simply entitled ‘banana muffins’. It had a five star rating, albeit if I am honest from only one reader. Despite this and despite not having two of the ingredients required i.e. pecan nuts and buttermilk, I went ahead as planned. PS, I should mention that the BBC Good Food site is one of my go-to sites for basic recipes as 9.9 times out of 10, they yield delicious products. The 1st step in my banana muffin making was making my buttermilk replacement – mixing the 125 ml milk with a teaspoon of lemon and letting it sit for 20 minutes while I weighed out the rest of my ingredients. This is a good alternative to buttermilk as sometimes buttermilk is hard to find or not something you necessarily have in your fridge. Or put another way, you are more likely to have lemon or vinegar (vinegar works just as well) in your kitchen arsenal than buttermilk. I had a bag of handy walnuts, so used these instead of pecans. Not to bore you with the rest of the process; lets just say that I followed the rest of the recipe as outlined on the BBC Good Food site until I got to portioning out my muffins. Although the recipe suggested that it made 12 muffins, I used large tulip muffin cases and so the recipe only yielded 8 rather plump looking muffins. Despite this, the cooking time was still around the 20 minute mark in my fan oven at 170 degrees Celsius. I ate my first one (yes, I ate two) warm with a cup of tea for breakfast. Nothing beats a warm muffin just out of the oven. However, just to check my theory, I thought I would try another one, this time cold, with a cup of coffee to recover from a shopping trip to Fairford. Okay, shopping trip is a bit exaggerated as I merely picked up a few groceries from Londis, fresh vegetables and bread from the Fairford Market and toiletries from Boots. Low and behold, my theory seemed to be correct. The flavours of the muffin seemed to be more enhanced when it was warm. I needn’t have tried that second muffin after all – while my taste buds may have liked it, I am sure my waistline or the scales won’t be liking it shortly. In conclusion, although a very fine muffin indeed, I feel that it could benefit from a little added spice (a pinch or two of cinnamon and/or allspice) and possibly toasting the walnuts (or pecans) before adding them to the mixture to get a nuttier flavour. I will have to wait until I discover another batch of browned bananas on the top of my storage rack before I can put these suggestions to the test. However, if you already have some brown bananas which need to be used up give my suggestions a go and let me know what you think. You will find the recipe for the banana muffins (by Elena Silcock) at www.bbcgoodfood.com. Happy baking! It was with a lot of thought and a little bit of sadness that I decided to make all of my previous posts private, except for the recipes that I have posted over the past few months. What started out as a personal blog, documenting the trials, tribulations and triumphs of me becoming a pastry chef and the 1st year after graduation, now needs to take a new direction. It needs to become a professional website, where potential customers and interested parties can see what I do on a professional basis. 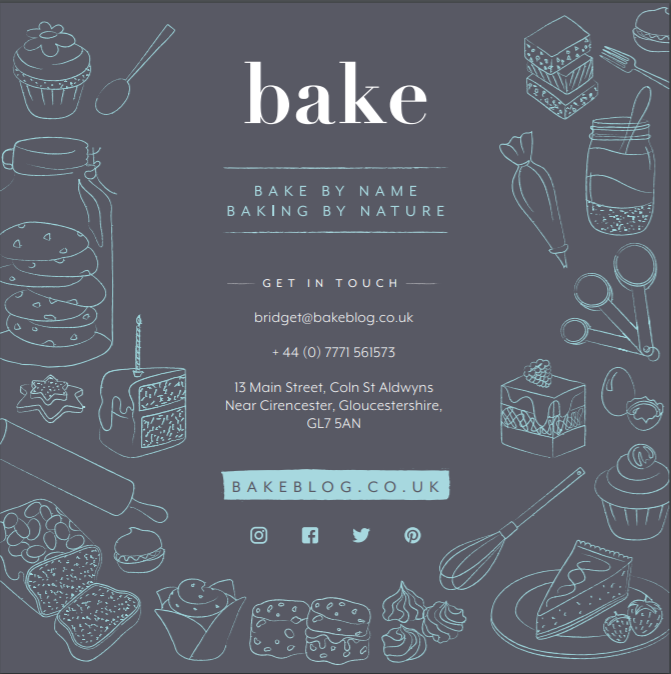 This decision was made on the back of getting the very talented people from Design and Code, who set up this site for me in the first place (as I took my first steps to becoming a pastry chef), to make me a flyer to promote my professional home baking business. With www.bakeblog.co.uk highlighted boldly on the front of the flyer, I decided that, as with the flyer, my website now needs to highlight a different stage in my second career. For those have followed my journey up until now and have enjoyed my story and anecdotes, thank you for your readership and comments. It is always heartening to see the view count climbing. While my site may need to focus more on my baking and less on my personal journey going forward, I trust that my posts will still be of interest to those who have read my posts to date and any new visitors to the site. Knowing me, it will be very difficult to leave out personal anecdotes anyway.